– that ruggedly beautiful mountain that was our majestic backdrop. It was showing its distinguished peak from just about anywhere you were in and around town. No wonder it tempts so many mountain climbers. Some travelers report being in Zermatt 2 or 3 days and not able to see the Matterhorn due to clouds. We were so lucky to see it every day with either perfectly blue skies or light clouds that provided interesting shadowy photos. Our group of Texans had a very enjoyable time in the lovely village and nearby towns. We skied and toured and enjoyed the bars and shops in the easily walk-able town. We did however learn that the use of only electric vehicles did not mean the streets weren't busy. It just meant you had to really look to make sure one of those silent vehicles wasn't on your heels! The weather was fairly warm for January during the day - nights were another story. One of the coldest places was riding the special gondola to the top of the ski area where you could climb to a lookout point for fantastic views of a dozen peaks all over 4,000 meters high. At the top was also an interesting place called Glacier Palace (probably colder than the gondola ride) where you could see inside the actual glacier crevasses and see artistic ice sculptures plus slide down an ice slide. At the top is also where a skier could head off to the left and in not too long be in Italy. Quite a few in the group made this trip to a foreign country via skis and no longer requiring a passport to do so. It was fun to access the different parts of the ski area by the gondolas, aerial tram, a funicular or most magnificently by the Gornergrat cogwheel train in use for over 100 years (see photo above). The non-skiers could also use these means to get to see wonderful vistas and eat or drink near or at the top of the ski areas. Even though it barely snowed the week we were there, the snow conditions were nice and the coverage was plenty for most areas. Leukerbad where some of us braved the sport of sledding down a pretty good hill. It was a bit scary the first time and took some skill since there was not any hand steering - you used your feet! It was also foggy which added to the thrill (or scariness). After a nice lunch the group split and either went to the thermal baths or on a walking tour of the village. Another day trip was to Brig where we did a quick historic town tour via a tram and then toured an interesting castle. After that we had some free time during which most enjoyed local traditional restaurants and some had successful shopping. The Swiss food was very good and the desserts were great! And for the chocolate lovers in the group (myself definitely one), the chocolate shops had the most wonderful, different types of candy. And the Swiss people are so very friendly - hospitable and proud to share their heritage, culture and landscape with us. Following the week in Zermatt, part of the group continued on to the post trip in Malta. What a surprise this trip was. Our 4 night stay was filled with activities. We stayed in a very nice hotel in a resort area called St. George's Bay. From there we made day treks around the relatively small Mediterranean island - enjoying the moderate temps. The first day we toured two different remains of prehistoric temples older than the Egyptian pyramids. We also did a tour of the "Three Cities" -actually very old, very small towns of Vittoriosa, Cospicua & Senglea where we walked where you couldn't drive and admired the unique architecture and went into a unique 300-year old house under restoration. Some of us braved the cold sea spray and went on a boat ride in the Grand Harbor on a very small boat called a fregatina. And not to be forgotten was our visit to a garden where we held an actual Maltese falcon. On the second day we saw the highlights of the largest city Valletta - parts of a palace, a beautiful cathedral, and heard lots of stories about the Knights of St. John that greatly influenced the country for many centuries. We then went to the silent city of Mdina and saw sights within the medieval walled city and nearby we went below ground into a large group of catacombs. The last day most of our group stayed with our wonderful guide Josette for an optional day in Gozo. A large ferry took us on a 30-minute ride over to the much smaller and less busy island. We saw another cathedral, a very large and impressive citadel, a beautiful coast line with salt pans and interesting rock arch structures, and a village known as Popeye's village since it was the backdrop for the Robin Williams movie. As you can see, the post trip had a large variety of sights. We heard stories from Malta's past that few of us knew of other than it's role during WWII. We feel lucky to have experienced this unique trip to a beautiful little island in the middle of the Mediterranean. It provided a completely different vista than that seen the week before on much colder days in the beautiful, snow covered Swiss mountains. Both parts of this Winter Expedition were wonderful, leaving us with many great memories. The non-skiers had 3 opportunities to explore nearby towns as a group. On Monday we went to Sion and were led by a wonderful guide on a walking tour of the historic town that included viewing catacombs and 500+ year old mansions and town halls. That afternoon we enjoyed wines from the Valais region at a nice winery. Several of the group made purchases to drink during the rest of the trip or take home. Another fun day was in Leukerbad where some of us braved the sport of sledding down a pretty good hill. It was a bit scary the first time and took some skill since there was not any hand steering - you used your feet! It was also foggy which added to the thrill (or scariness). After a nice lunch the group split and either went to the thermal baths or on a walking tour of the village. Another day trip was to Brig where we did a quick historic town tour via a tram and then toured an interesting castle. After that we had some free time during which most enjoyed local traditional restaurants and some had successful shopping. Zermatt – Jewel of the Swiss Alps. Home of the Matterhorn. It’s a great place for skiers and nonskiers. Then you have the unique option to extend your vacation on Malta in the gorgeous Mediterranean Sea. Malta? Most Americans don’t know what or where it is. Keep reading and soon both locations will be on your must visit list. We are planning a full itinerary for skiers and non-skiers. Flights from Houston or Dallas will depart for Milan on Friday afternoon, January 18. After arriving in Milan Saturday morning we will bus to Tasch and then travel via the unique cog railway from Täsch to Zermatt. The luggage will be transported for us from the train station to the hotel. The clubs are staying in just two hotels not far apart –Astoria and Perren- so we can mix and mingle fairly easily. The town of Zermatt is geographically small with an active town center. The village is a combustion car-free zone in order to prevent air pollution from obscuring the town's view of the Matterhorn, but there are battery operated cars, electric buses and even horse drawn cabs so you don’t have to rely solely on your own feet to get around. 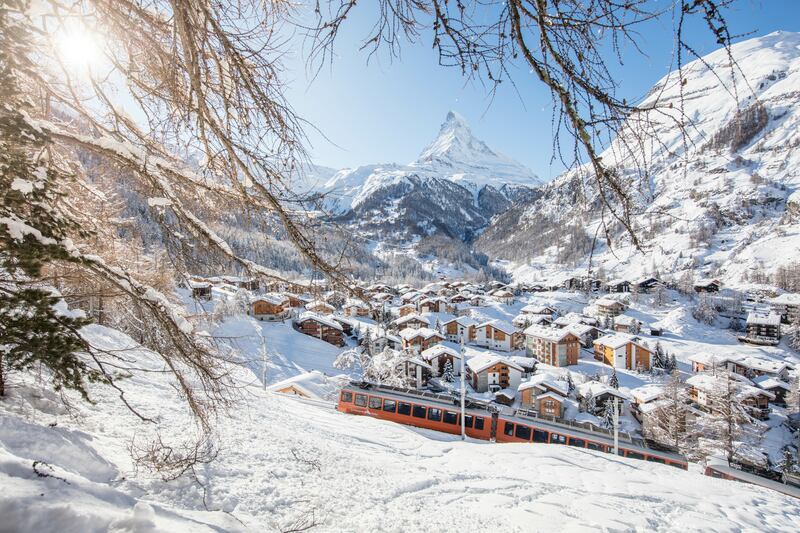 For the skiers, Zermatt is split up into four interconnected ski areas: Rothorn paradise, Gornergrat, Matterhorn glacier paradise, and Schwarzsee paradise. With so many areas, he slopes offer skiing for all skill levels. Gornergrat has beginner runs. Overall the Zermatt ski resorts have the most intermediate runs of all of Switzerland. This makes it perfect for the typical skier, who can cruise around on wide groomed runs, but also offers off-piste options for advanced skiers. The scenery is so gorgeous that you will want to take your time coming down the slopes to soak it all in. You can also ski in Italy and Switzerland on the same day. Each area is reached from Zermatt village via the cog railway, funicular or gondola depending on where you are headed. Lift tickets will be sold at the window at the ski resorts – allowing you to plan your days when you get there instead of a month in advance. Also, it is required to show an ID at the ticket window if you want the senior discount ticket. Saas-Fee – Take the cable car up to Matterhorn Glacier Paradise. At 12,780 feet, it’s the highest mountain lift station with revolving restaurant In Europe. Down inside the glacier is Glacier Palace where there is a walkway carved through the ice and filled with ice sculptures, an ice throne and slide. New since 2016 is an exciting simulated avalanche experience. Another activity is sledding down one of the longest runs in Switzerland – 7 miles! For the most adventurous ones, there is a guided mountain tour along a gorge with frozen waterfalls that takes you across suspension bridges, ladders and steel ropes and a zip-line. 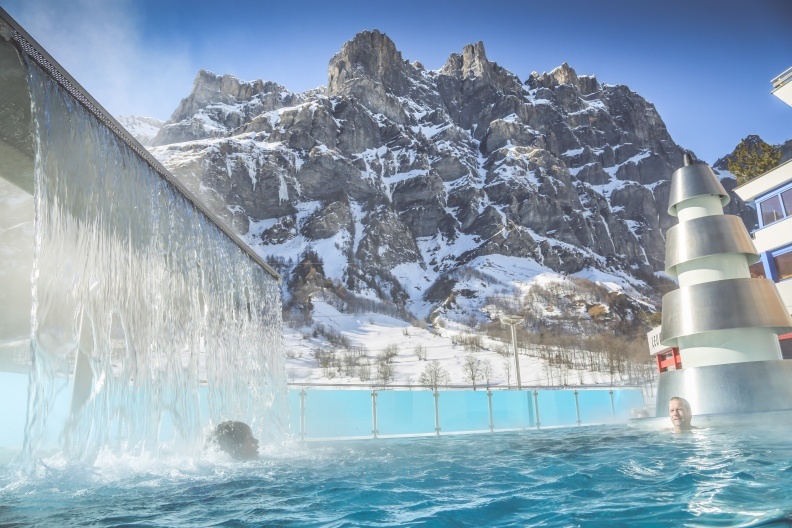 Leukerbad – The largest thermal spa in the Alps with 32 pools and various spa facilities. This location also has a cable car ride up to a panoramic restaurant. 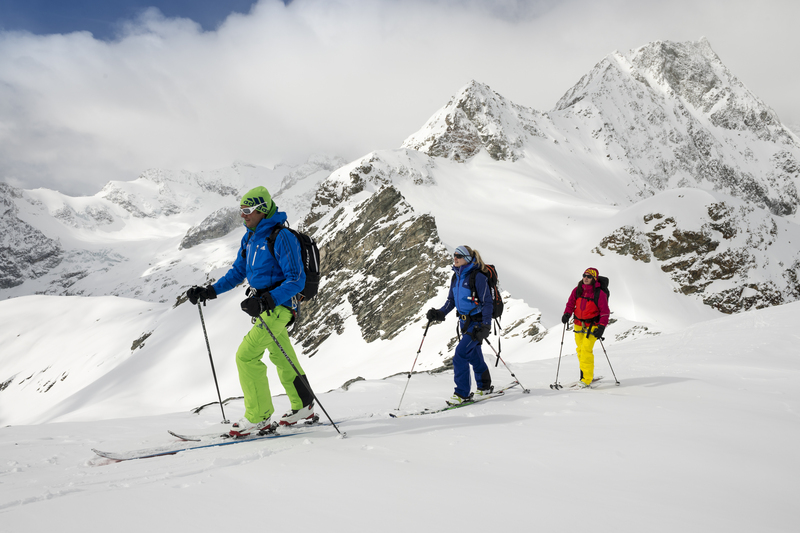 Before going to the spa you may want to go snowshoeing or do another sled ride – much shorter than the one at Saas Fee. Or if you want to do another challenging winter hike, there is the famous 25-mile, 4-hour Gemini hike. Brig –the cultural hub of the region. The visit includes a city tour and a guided tour of the 17th century Stockalper Palace. If you didn’t go to the Leukerbad spa, instead of the tours you can go into thermal baths here as well. Castles and wine tasting - always popular. This one is in the Valais region. More castle info to come but the wines are known. In this area Pinot Noir and Gamay are the favored reds. Switzerland's favorite white grape, Chasselas (Fendant) is also found here. Daily breakfast and dinner is included in our package, but there are many good restaurants in town and on the mountain to try for lunch and of course bars for après ski. Menu items include local cuisine such as rich cheese fondue, raclette, and huge rostis (potato pancakes). The Zermatlantis/Matterhorn museum showcases the history of the village where visitors can experience the dramatic events of the first Matterhorn ascent over 150 years ago. For your post skiing adventure we have selected an exotic yet very affordable location where few if any of you have likely been. Four nights in a very nice hotel in the UNESCO World Heritage capital city of Valletta. Malta is a Southern European Island country that lies 50 miles south of Italy. Not many can say that in January they were in the snowy Alps one day and on an island in the Mediterranean Sea with 60 degree temps the next day. There are numerous excursions to take to learn about the history, beautiful architecture and lively character of the people and places. Malta has been inhabited since prehistoric times and ruled by at least 14 empires or countries – most leaving their mark on the country’s culture. We are planning one full day and one ½ day excursion and you will still have a day and a half to explore, shop, relax on your own. The selections have not yet been made but any of the options offered will be amazing. Excursions could include guided tours of Valletta, Mdina, or Gozo and/or ancient temples. Valletta tour highlights include beautiful Barrakka Gardens, St. John’s Cathedral and Grand Master’s Palace. Mdina is small and quaint and known as the Silent City. The tour includes Mdina Cathedral, St. Paul’s Catacombs, Dingh Cliffs and more. Gozo is a 20-minute ferry ride away and is an island where time seems to have stood still. The tour includes seeing the inland seas and bays, the medieval streets of Victoria (Rabat), Temples of Ggantija, the Citadella and visits to woolen and lace product shops that the area is well known for. For your 1.5 days of unscheduled time, we can give you information on other tours and activities. 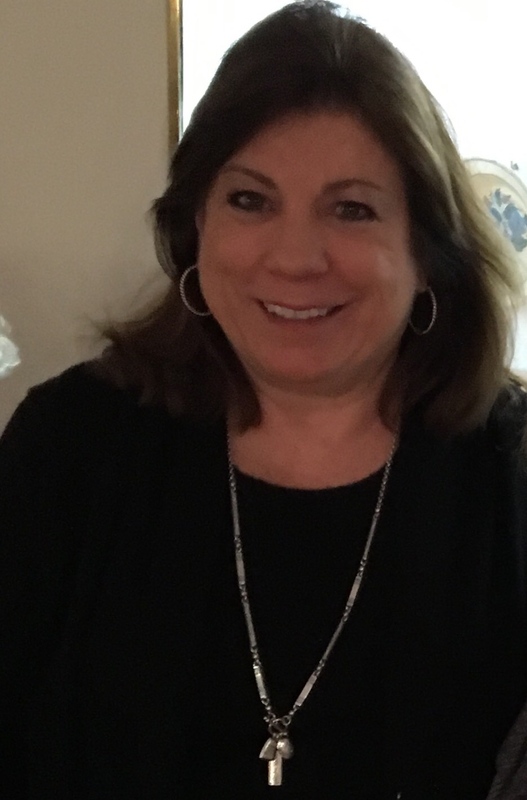 I hope you join me on this spectacular trip. Contact your trip leader or me for more information.